The Ruth Page Center for Arts (RPC) is located just steps from the Michigan Avenue “Magnificent Mile” in the heart of a lively shopping, dining and cultural district. The historic 1927 building that The Center calls home sits on a lovely tree-lined street in the heart of the Gold Coast neighborhood. The Center underwent a transformation during the summer of 2017 as they remodeled the front façade and lobby areas for a more modern and open feel. The Ruth Page Center for the Arts carries forward the mission of helping to develop great artists and connect them with audiences and community. Founded by Chicago icon and internationally-renown performer, choreographer and dance patron, Ruth Page, The Center reflects her vision of supporting dance excellence in Chicago. As a prominent force in the Chicago arts community, The Ruth Page Center for the Arts carries on that legacy through its initiatives and programs that nurture the dance art form, and by being an arts incubator for emerging and established artists and arts organizations through its Artist-in-Residence programs. Porchlight Music Theatre is proud to be The Center’s newest Artist-in-Residence and eager to collaborate on the many synergies between dance and music theatre; adding to RPC’s continued success and creating an even more vibrant center for Chicago performance and education. The Ruth Page Center for the Arts boasts an impressive roster of resident companies including Chicago’s first ballet company, Chicago Ballet, who can trace their roots to RPC, as well as Lookingglass Theater Company and Chicago Shakespeare Theater, who both called The Center home before moving on to establish their own venues. The Ruth Page Center for the Arts features a spacious, yet intimate proscenium theatre, accommodating 215 patrons in both main floor and balcony seating. In addition, RPC has numerous classrooms and rehearsal spaces used primarily for their own dance education programming. Their facility features a new urban industrial-meets-vintage chic vibe to add to everyone’s overall experience. For its own productions, Porchlight Music Theatre operates the box office, as well as concessions and merchandise sales. Porchlight Music Theatre presents its Mainstage and Porchlight Revisits productions at The Ruth Page Center for the Arts. Other programming, such as the New Faces Sing Broadway series and the annual Chicago Sings concert, are held at other venues. Our new home is completely handicap accessible with an elevator to the balcony and lower levels. Additionally, as launched with the 2016-2017 season, we are proud to offer Open Captioned performances for each Mainstage production. Click here for more details on this and other accessibility programs. The Ruth Page Center is easily accessible by bus (#22, #36, #70 and #156*) and “L” train (Red Line Clark & Division stop), visit the CTA website to plan your trip and for the most up-to-date information! *Please note the #156 LaSalle does not operate after 7:30/8:10pm, or on weekends and holidays. Valet – Valet Parking is $15 and can be found directly out front of the Ruth Page Center. On-street metered parking – limited street parking is also available throughout the neighborhood – $4 per hour, with a 2-hour maximum (surge pricing may apply, check meters for current pricing). Public parking lots – There are numerous paid lots/garages in the area. We encourage patrons to use spothero.com or a similar discount, pre-paid parking website/app to secure parking in advance. Newberry Plaza, 1030 N. State Street, just around the corner from RPC and in the midst of many dining options – $8 for 3 hours; $12 for 6 hours; $15 for 12 hours – patrons must purchase a discount parking “Chaser Card” at the RPC front desk after parking in this lot. LAZ Parking, next to the Hotel Indigo at 1250 N. Dearborn St, just north of Division St. – $12 for 6 hours – parking stub must be validated at the RPC front desk. The Gold Coast is one of the most famous districts in Chicago for dining and we know you will enjoy trying the varied options, many within just a one-block walk of the theatre. Many eateries are located on or near the famed triangle where Rush St. meets State St. An area densely packed with dining and drinking options, the area is awake long after the Loop has gone to sleep. Here are some of the closest options for pre- and post-theatre dining. Blue Door Farm Stand – $$ – 2010 N. Halsted – homey farm-to-table cafe with American eats & cold-pressed juice as well as home & pantry items. Upscale pub fare located right on the hot strip of Division St. bars. Hopsmith Tavern has got you covered for all of your pre-show or post-show party needs with Customizable food and beverage packages and private space available depending upon your needs. Click here or contact Mikaela Melendez to reserve today. Improved seating – accommodating 215 patrons in comfortable traditional theatre seating (up from 150 seats at Stage 773). 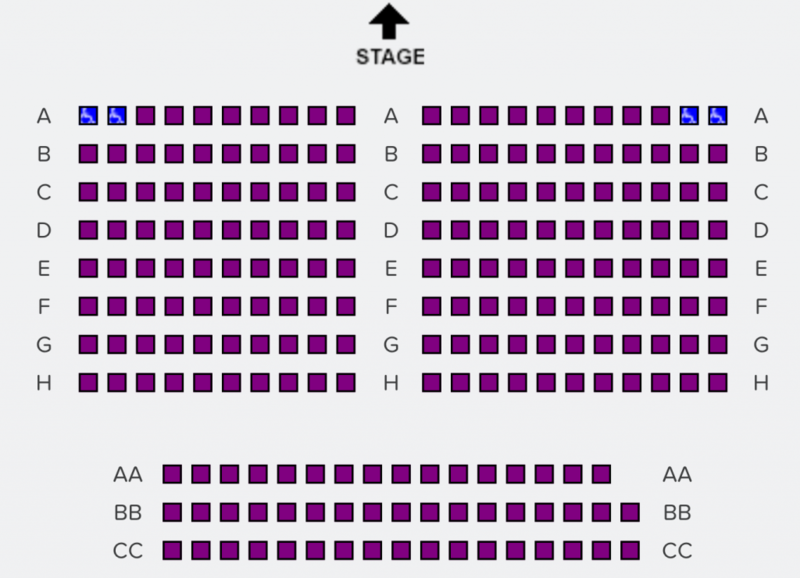 Opportunity to select specific seats – all seating is assigned (no general admission) and will be selected by you when you place your subscription or single-ticket order. Better box office service – Porchlight will be handling all aspects of the ticketing experience, offering you the best and most knowledgeable service possible, including walk-up, phone and online sales. More dining options – An array of dining options are within one block of the theater. More public parking options – There are numerous self-parking options in the area (see parking info below). Better accessibility by public transportation – Many bus lines are within one block, and the Red Line is just 2-1/2 blocks away. When will subscriptions go on sale? Single tickets? Subscriptions and single tickets are currently on sale and will continue into the coming season. Can I choose my seats for the whole season? What if I need to change a date? Yes, you will have the opportunity to select specific seats for the entire season. Of course you’re not locked in, as exchanges are a main benefit of subscribing! Single tickets can be exchanged for a fee, based on availability. Why is Porchlight moving to Ruth Page? Over the last few years, Porchlight has experienced an increase in subscribers and single ticket buyers that has accompanied an increase in the volume and scope of Porchlight Music Theatre programming. These factors pointed to the need for a larger capacity venue that would still retain the intimate approach for which our musical productions are known, as we work to expand our audience and supporter base for future seasons. Stage 773 has been an invaluable venue for us and we’ve truly enjoyed their partnership in our being a resident company there, but as Porchlight grows and our artistic and audience needs change, being an Artist-In-Residence at the Ruth Page Center for the Arts offers Porchlight significant opportunities for our production capabilities and exposure not only to the community around the Center, but also to Chicago’s tourism and travel markets. Not only will we be in a higher visibility neighborhood, Porchlight will also be managing our own box office services to offer our patrons the best customer service possible as well as handling concession/merchandise sales. Where is the other artistic programming held? For the 2017/18 season, the New Faces Sing Broadway series will be presented in two locations: Uptown Underground (link) and Skokie Theatre (link). The Chicago Sings concert location varies.